Are you looking for a new book at bedtime? Does your child love hearing their own name in a story? My 3 year old daughter LOVES hearing her name incorporated into a story, and now that she knows how to spell it, she loves finding her name in a book! We recently received a Flattenme book for review, and my daughter loves it! 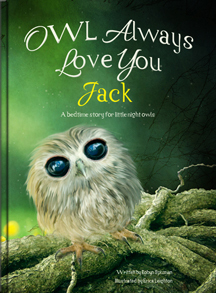 What is great about Owl Always Love You is that it incorporates the child's name on each and every page. This helped to reinforce the recognition of her name, which we loved! We play a game each night and ask her to find her name on the page, as we read the other words. The overall story is about going to bed, which is perfect as a bedtime story! We loved being able to preview the book, as we are very selective about the content that our children read. What makes it REALLY fantastic, is this book is the perfect book for gift giving. Often, personalized books require a photo, and you may not have a photo of the gift recipient. This book does not have photos of the child, but it has the most adorable photos of little owls! I love the Flattenme books! They take such care to provide a quality product. Thanks for this great info! This book looks super cute! I will have to look into them! My daughter would love to hear/see her name in a book! Thank you for the review! What an awesome book! I would love to get this for my niece...so sweet! How cute!I love personalized books. My kids love to be recognized in a book they get a big kick out of it. How neat! Would be great for my sons to hear their names in books..they'd love it! looks very cute I love it! story time is the best! And I love that the ids name is in the book! even better! thank you for sharing! What a cute book and how kids love hearing there name in them. My son, his birthday is next month and he loves personalized books. I would give this book and make it for my daughter. If I win, this will be for our first grandchild who will arrive in December. My boys or my niece would like this book. I would like to win this for my four year old son. My daughter, she loves owls. My Baby Girl, Love Owls And Her!!! I would make this book for my 4 year old son Josh, it would make a great Christmas gift! id make this 4 my son! I would love to win this for my grandson Seth. I would make this for my son! I would give this to my youngest daughter. My oldest has a couple of personalized books and I'd love to give my youngest one! I would make it for my friend's son Nicholas. He is so, so very loved, and his parents are owl fans.